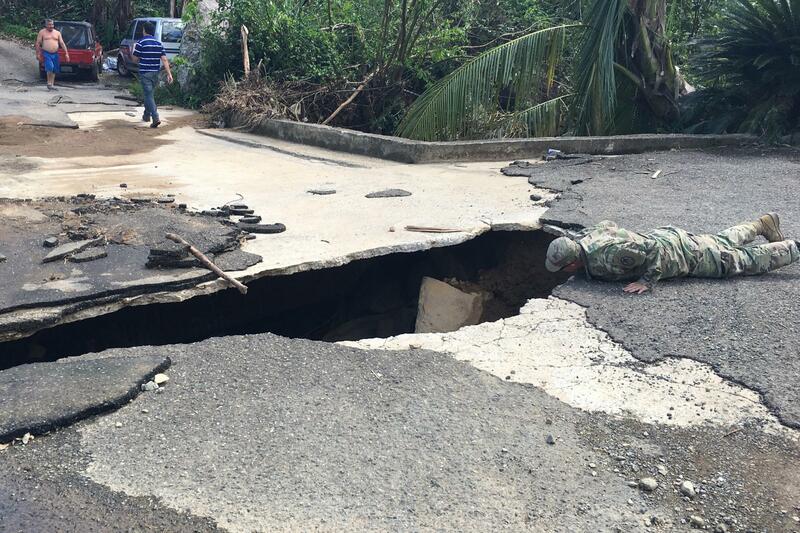 Santa Isabel, Puerto Rico mayor Enrique Questell Alvarado shows 105th Engineer Battalion Lt. Col. Cale Moody a road washed out by Hurricane Maria. Jay Price reports on a National Guard unit trying to repair hurricane damaged roads in Puerto Rico. It's hard to imagine a less glamorous mission. More than a hundred members of the North Carolina National Guard are working in Puerto Rico to reopen the hundreds of roads that were blocked, washed out, or buried by mud by Hurricane Maria. It's slow work, hampered by communication challenges and recent rain storms that made the damage worse. 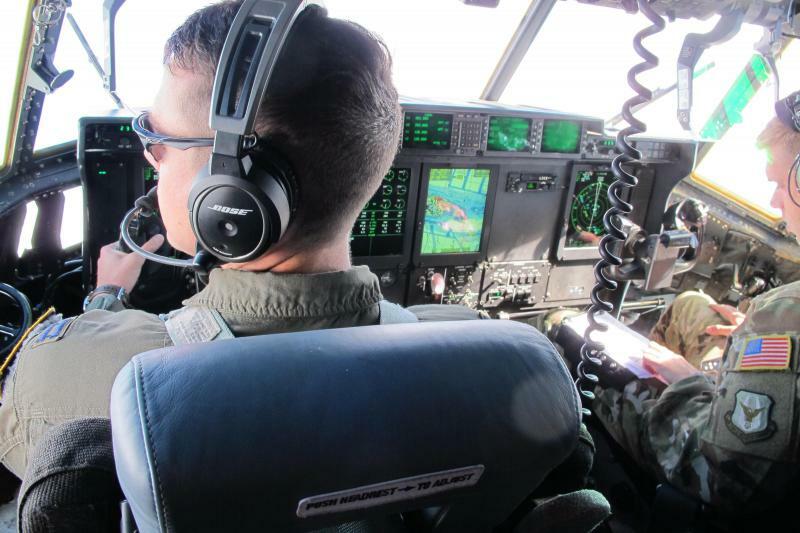 "We're identifying new missions every day and doing what we can, as quickly as we can, as safely as we can," said Lt. Col. Cale Moody, the commander of Task Force Rhino. The task force is led by soldiers of the 105th Engineer Battalion and is based in Raeford, N.C. The headquarters of North Carolina's 105th Engineer Battalion in Salinas, Puerto Rico has only spotty communications with the main National Guard command center. There's still no cell phone service on the Puerto Rican National Guard base where the Task Force headquarters is set up, and the still-spotty communications means Moody has to be a kind of disaster relief entrepreneur, scouring his huge area of operations, visiting local officials to see what they need, and sending small teams into remote areas to find the problems and build a list of what needs fixing. At one stop, he met Enrique Questell Alvarado, mayor of the town of Santa Isabel. The Mayor showed the soldiers a huge bite taken out of a road by stormwater rushing into a retention pond. "The used waters of the residents here goes to this retention pond," Alvarado explained through an interpreter as he stood above a deep pit where the road and sidewalk once were. 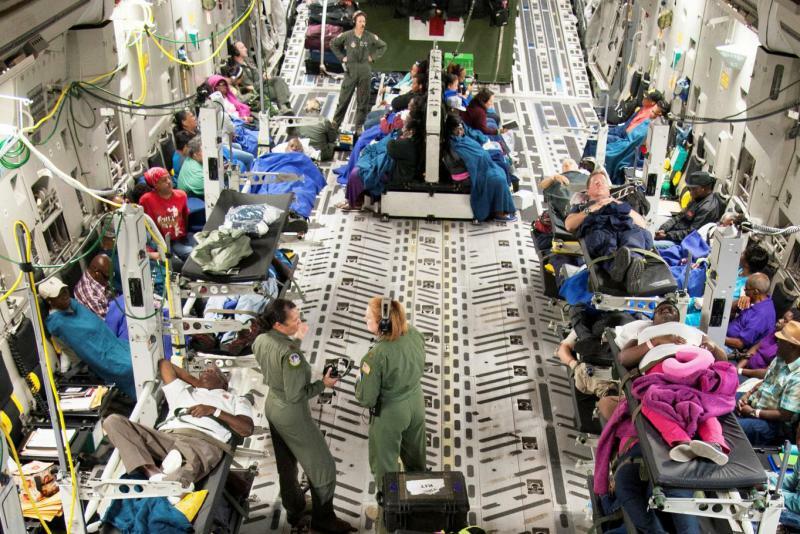 "The hurricane was so much flow, you can see what's going on here." Moody walked around the damage, thinking through the type of repair. He asked the mayor to find some gravel or fill dirt and promised to return. So glamorous it's not. But it could not be more vital. The big problems that millions of Puerto Ricans face can't be fixed if the roads aren't passable. Without roads, they can't get food and water, and trucks can't bring it to them. And utility crews can't get in to repair power lines and replace the estimated 62,000 utility poles that are down. That road washout at the retention pond? If it grows a few more feet with the next rainstorm, it will undermine a utility pole and make it that much longer before electricity can be restored to the neighborhood. And it's worse on the countless one-lane roads in the mountains, where Moody's teams are still finding small communities cut off by road damage from landslides and flash floods. Every day the Task Force sends reconnaissance teams to drive the roads, record the locations and types of damage and make notes about the kind of repairs needed. "Mainly our purpose is to go out and find the work, and then I'm there to assess," said 1st Lt. Erin Graham, who is a Greensboro, N.C. firefighter in her civilian life. "We've probably came across fifty different routes that need clearing." 1st Lt. Erin Graham of the North Carolina National Guard inspects a washed out bridge in the small Puerto Rico community of Vallaja. Graham's driver and translator is Specialist Angela Mull, a National Guard medic who is a nurse's aide in Fayetteville, N.C. On a recent run, Mull threaded their armored humvee between mudslides and sheer drops on narrow roads of the mountains north of the city of Ponce, with Graham jumping out to guide her through the narrowest parts. Halfway up a mountain, Mull hit the brakes. A washout had eaten away the soil under a small bridge, opening a gap nearly all the way across the road at one end. When Graham got out assess the repair, a shirtless man walked down the hill. Jose Martinez tends the animals at an agricultural school down the mountain. The washed out road, he said, isn't just preventing residents from driving. "This is all debris so it has actually clogged it," Martinez said through an interpreter. "So when it rains it comes over the bridge, which creates more damage to the road, and it goes down and around the culverts and into the houses." The tiny community is called Vallaja. Martinez said about two dozens families live here. At least, there were that many before the storm. His father, who lived next door to him, left because the damage to the road diverts any storm runoff coming down the mountain into his house. Graham said that many residents greet her and Mull, hoping the troops have come with food or water. They have to explain that they're engineers, coming not to distribute relief supplies but to assess the roads. But Graham said they also promise residents that they'll inform their higher-ups that people in the community need help. "At least they have a voice," Graham said. "Someone is coming; somebody knows about you." If the Guard troops can fix the road that help will get there sooner. Whenever "sooner" is. By some estimates, it will be almost summer before electricity is restored everywhere. And even in towns and cities with running water, people are still standing in line for hours to get bottled water and food. 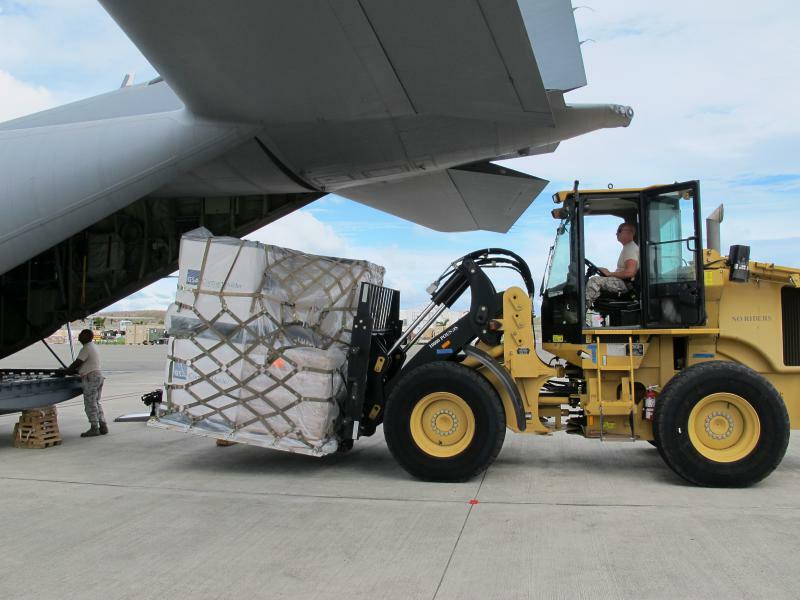 Task Force Rhino began arriving in Puerto Rico Oct. 3 for what is scheduled to be a 30 day mission. "When our time is up, there will still be plenty of work here," Moody said. "It will take them a while."